How I plan to Recreate The Fun Janmashtami of My Childhood For My Daughter? Janmashtami holds much nostalgic value for me. It was one festival where we fasted, but still it felt like we were feasting. 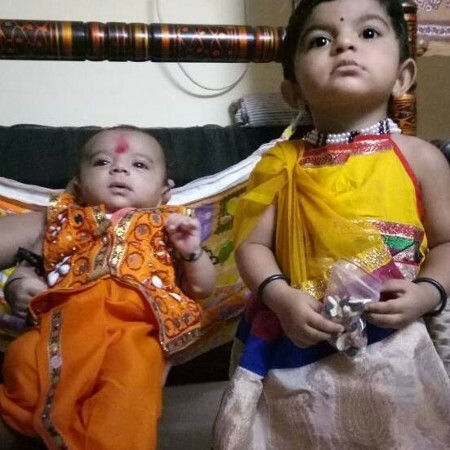 I have been married for almost 10 years and have a 5-year old daughter, but I do not celebrate Janmashtami as it is done in my parents’ house in Ahmedabad. Now, I regret that and intend to change it, beginning with this Janmashtami. Janmashtami was always a two-day festival. The first day everyone in the family, except small kids, observed a fast. I remember my mother cooking normal dal, roti and subzi for us, kids, while she prepared a special fare for elders, who were fasting, that included ‘rajgira ki roti’, ‘dahiwale aloo’ and ‘aloo ka halwa’. It was needless to say that even though kids were not fasting, they preferred to eat the ‘vrat ka khana’; it was simply delicious and a once-in-a-year menu. She would also make various kinds of sweets like ‘panjiris’, ‘taal makhane ki kheer’, ‘nariyal ki barfi’ and ‘khoye ki barfi’. Though these sweets were first offered to the deity before it could be consumed by the household, my mom would allow us to taste a little. In the evening, a few of our family friends visited us for a game of cards. In Gujarat, it’s a tradition to play cards on Janmashtami (saatam-aatham). And, my mom would serve ‘sabudana ka vada’ or ‘kuttu ki pakodi’. At midnight, that’s when Lord Krishna was born, we bathed the small idol of Lord Krishna in some milk and water and dressed him up in new clothes. We sang prayers and did ‘aarti’, and lastly we offered him fruits, nuts, and the sweets that were made by my mom. I loved this time, as the melodious sounds of the bells from the various households and the nearby temples filled up the atmosphere. The next day was more fun. We plucked flowers and wove them into garlands, and decorated the small wooden cradle on which we placed the ‘ladoo gopal’ (Lord Krishna) and took turns to swing him. The idea behind it being - Baby Lord Krishna had visited your home, and you needed to take care of HIM like you would care for an infant. In the neighbouring residential complex, there would be a ‘dahi handi’ program and it was fun to watch grown ups aiming to break the handi climbing up a human pyramid. Those were fun times, and I sorely miss the beautiful atmosphere of Janmashtami of Ahmedabad. Now, that my daughter is 5-years old, I intend to recreate some of the fun moments of my childhood Janmashtami for her this year. Relish holy food: I will cook the exact lunch as my mother does year-after-year on Janmashtami. And, may be a couple of sweets. Tell a tale: Two to three decades ago, Krishna had been an inspiring character for most kids. Sadly, my daughter knows HIM only as an animated character on TV. I intend to change that. I want to narrate interesting tales of naughty Krishna to my daughter. A Temple visit: There is an ISKCON temple in our neighbourhood. I will take my daughter to visit a ‘Haveli’ (it’s a temple exclusively for bal gopal) so that she can witness the grandeur and experience her religion from close quarters. Dahi handi: I will buy a small clay pot that I can fill with candies and tie it up on a rope. My daughter and her friends should have a gala time trying to reach the pot and breaking it to get the goodies. Dress Up pretty: Girls love dressing up, so does my daughter. I have bought a new ‘ghaghra choli’ from Ahmedabad, which she can wear with a lot of accessories. She can be my little Radha for the day. I want to recreate the fun Janmashtami from my childhood. It should be a welcome change for my family and a precious walk down the memory lane for me. Beautiful pic of kanha and radhaji, Forum! Hope you had a great janmashtmi this year! Take care and have fun!